All prospective club members wishing to see what we are about may join one social ride-out and be at ease with a club observer looking after them, and they will not, as it were, be ‘on their own’ within a group of bikers. 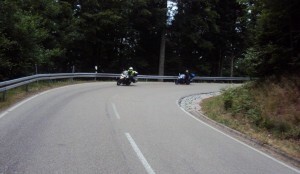 To enjoy further ride-outs it will be necessary to join one of the IAM courses offered by the club. After completing the first three sessions and, with an observer looking out for you, ride-outs are there to be enjoyed. 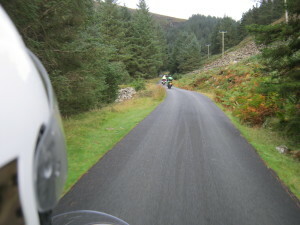 Ride-outs are a great way to develop and put into practice the skills learnt on an IAM course, keep in touch with other club members and enjoy various roads and scenery with an experienced group of riders. So, ‘What is involved on a ride-out’ you ask, ‘Should I give it a go?’. Of course you should! ‘Will I keep up?’. ‘Will I enjoy it?’. Of course you will! 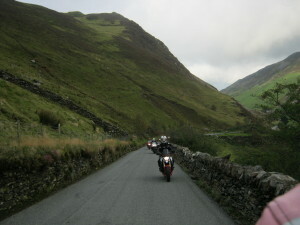 Sunday social ride-outs occur throughout the year, whereas Wednesday evening ride-outs are between April and August inclusive. Sunday ride-outs start at Costa Coffee, Grand Junction, Earle Street, Crewe at 9am from April during summer months and 10am from the beginning of October during winter months. We meet up 10/15 minutes beforehand for a chat and ensure all know where we are heading for the day (don’t worry, the second man drop-off system comes into its own here) and set off soon after. We usually ride between 150/200 miles. We have a breakfast stop, of up to an hour, after having ridden for over an hour but no more than two. After another hour and a half or so of riding, we have a half hour stop for a brew (and cake!) at a café then ride for a similar time to the final brew (more cake!! ), before setting off and arriving home around 6pm. If all this seems too onerous, don’t worry! Some members return home after breakfast or first brew stop: just let others know before setting off home. Wednesday evening ride-outs have a different feel to them with a mileage of between 60 and 100 miles. Again, we meet up 10/15 minutes before we set off, at 7pm. First and third Wednesday evenings of the month start from Starbucks (A54), Holmes Chapel Road, Middlewich, CW10 0JB, adjacent to the Shell petrol station: handy to fill up! Second and fourth Wednesday evenings from the Little Chef (Barthomley) on the B5078 Radway Green Road, CW2 5PT, next to Junction 16, M6 and which is also adjacent to a petrol station. We normally ride for between one and two hours before stopping for a break at a McDonalds, late night café or a country pub, then head home arriving between 10pm and 10-30 pm. If you would like to join us on a ride-out, it will be great to have you along, just arrive in good time with a full tank of fuel; and you will be made most welcome. The primary consideration at all times when riding in a group is safety and at no time should the safety of riders or any third party be compromised for any reason. While the system should result in the elimination of undue risk for most circumstances it always remains the personal responsibility of all riders to exercise their own judgement about every course of action that they take. Each rider is responsible for their own safety, their own actions and any consequences that those actions may have. Traffic laws must be obeyed at all times when riding on the Public Highway. At no time when participating in a Group Organised Ride will any person riding in the group be expected or required to act illegally. If there is a conflict between anything and the Law, the Law must take precedence. The ratio of Associates to Observer/ Senior Observer on a Group Organised ride should not exceed 3:1 and ideally should be no more that 2:1. In all cases, the Leader must be a qualified Observer (including Seniors) or a committee member. Where Associates participate, the Tail Ender must be an experienced Group Observer (Senior if possible). The following may take part in a Group organised ride. Associate (enrolled through an Advanced Riding course) who has completed a minimum of the first three sessions of the Advanced Riding course and who must be under observation at all times. Prospective Associate (who must be under observation at ALL times and must have been giver an individual assessment before being invited to take part in a Group organised ride.) A prospective Associate will only be allowed to attend one Group organised ride before enrolling with the Group for a Skill for Life course. The system is a method for ensuring that all turns are marked so everyone gets where the group is going, even if they don’t know the way. The system allows everyone to ride within their own abilities with no pressure to play ‘Catch Up’. Riders don’t need to keep the rider ahead in view, don’t need to go through red traffic lights, and don’t need to exceed speed limits as there will always be someone waiting to point the way. The Leader: Is the rider out in front. He/ she will be familiar with the route, and follow it as closely as possible. Once the ride sets off, everyone follows the Leader. The basic rule is that the route is ‘straight ahead’ at roundabouts and junctions. If at any point the route deviates from straight ahead, i.e. a turn off or uncertainty at a roundabout or the group has split up for whatever reason, the rider immediately behind the Leader stops to mark the way at the junction in a place prominent to the following riders. This must be a safe place which does not confuse or inconvenience other road users. The choice of position will usually be guided by the Leader who will be experienced in choosing suitable places. Once stopped, the second man waits until everyone except the Tail Ender passes him before setting off. If road and traffic conditions permit, the second man should re-join the group in front of the Tail Ender. If not, the second man allows the Tail Ender to pass safely before setting off; he/ she then catches up with and overtakes the Tail Ender to reform the group. When traveling on the open road, everyone must ride for themselves, i.e. each rider is responsible for his/her own safety. Always take the line you choose, allow sufficient stopping distance, and keep to the speed limits. Do not feel pressured to go faster by a rider behind you. Do not ride above your ability/ limits to try and keep up: you will not get lost as there will be a rider waiting for you at the next turning point. When traveling in built-up areas and waiting at junctions or traffic lights, for example, riders should close up two abreast. This takes up less space on the road and allows for more bikes to cross the junction(s) when the opportunity allows. If the group becomes very spread out or separated, there may be short stops to allow it to reform. Such stops may not be coffee stops – if the Leader’s helmet is still on, it’s only a re-grouping stop. If you need to overtake within the group, then that is okay but do it in a manner that is safe, lawful and considerate for other members of the group and other road users. they must tell the Tail Ender who then still knows how many riders are in the group.